Description: How to make an easy fall leaf collage from fall leaves, grasses, and flowers. Fall is a great time for kids to do fall crafts. Leaf collages are easy to make and can provide hours of fall fun. Kids enjoy looking for the leaves as well as using the leaves to create their creative collages. This project can be done on two different days. One afternoon can be spent outside looking for different colored leaves, pretty ornamental grasses, and interesting flower petals. After the kids have a good collection, have them lay everything out on some newspapers to dry. On a rainy day when there's nothing else to do or maybe on Thanksgiving Day while you're waiting for dinner to be ready, bring out the dried leaves and grasses to create the leaf collage. You will be using crayon shavings to get the sheets of waxed paper to stick together. This also adds some color to the collages. Choose some old crayons in a variety of fall colors and use the old cheese grater to get some shavings from the crayons. Working on a piece of newspaper, lay one sheet of waxed paper down and arrange the leaves, grasses, and flowers as desired. Sprinkle crayon shavings all over the sheet of waxed paper, so that when you iron the sheets together, they will completely stick together. 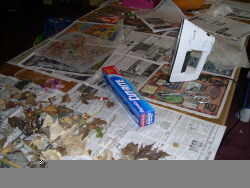 Next use the iron to press the two sheets of waxed paper together. Unless you're using an old iron, you should use a thin cloth between the waxed paper and the iron, or you might get crayon shavings on your iron, which will transfer onto the next thing you iron...believe me, I know! That's it! 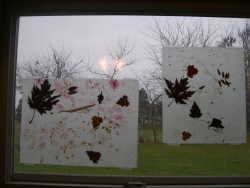 These leaf collages look great hanging in a window as a pretty fall decoration. You could also hang them on the refrigerator, frame them, or even use them as placemats.